Madrid. Teresa, a single, rich and independent woman, buys an antique sign for an early twentieth century Parisian fabric shop. The sign reads as follows: Aux tissus des Vosges. Alice Humbert. Nouveautés (Vosges weaves, Alice Humbert, New Items). A woman who spends most of her time painting, Teresa hangs the sign up as soon as she gets home and immediately begins to have Parisian feelings; as though the French capital were calling her. Inexplicably Teresa keeps experiencing the same sensations until she takes a decision after speaking to her best friend and mentor: she will drop everything and travel to Paris to see if she can get some answers. And she does. “A stupendous book”, Federico Moccia. 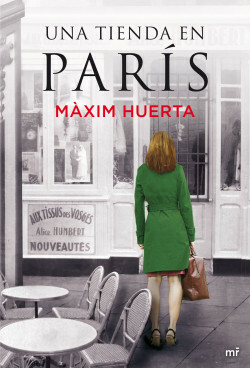 Màxim Huerta takes us back to the Roaring Twenties in the company of two stunning, marvellous, and irrepressible women. A moving, tender and exciting novel that will have readers dreaming. This is undoubtedly the most romantic book of the year. A well-written, quality novel with a very feminine touch. Sensitive and extremely moving. Planeta Brasil (Brazil), Marginesy (Poland), Sol y Lune (France), Sperling & Kupfer (Italy).